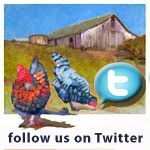 Bolinas Gallery 2009-Art on the Farm, originally uploaded by cproppe. 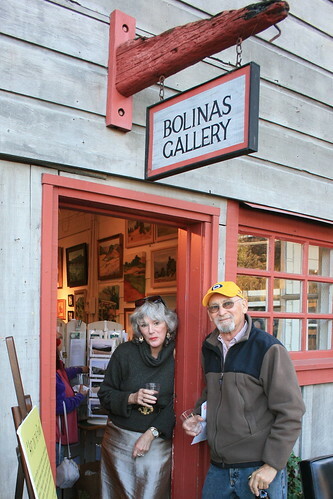 We had a great opening on the 7th at the Bolinas Gallery, at the end of Wharf Road, which is the way to "Surfer's Beach"... This day just happened to coincide with 20 foot swells at the beach, so it was amazingly crowded! A successful opening, a few pieces were sold, and many great compliments on the show. We hope that people will come out to purchase Holiday gifts. There are items from $4.00. up to several hundreds of dollars. Cards, prints, photos, and paintings. Come out to see the surfers, check out the tide pools at Agate Beach, get your seafood, and buy art! Now through November 30th, 2009. 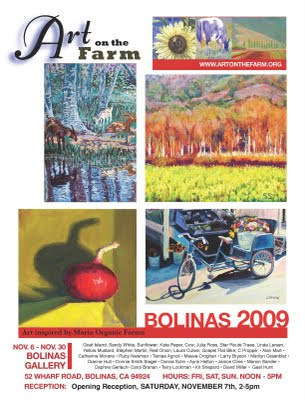 Saturday, November 7th at the Bolinas Gallery, 52 Wharf Road. Please come for our reception, 2-5pm to meet the artists, and view new paintings, prints, cards, photography by 26 artists from our group! This is a show not to be missed!